“EL” is the name of the God of Moses and for the Hebrew Israelite since their Exodus. It is also written and pronounced in plural “Elohim” as a form of high respect and reverence. It was the same name used by Abraham and Enoch. The Israelite also used to call God as Eloah, Ilah, and Allah. The patriarch Jacob was given the name Isra-EL 400 years before Moses and 1500 years before the words JEW and YHWH appeared. The Jews made gross mistakes by failing to recognize the God of Hebrew Israelite in 530 BC. Then they came up with various ways to write and pronounce Yahweh to make it similar to Elohim. First they said YHWH is too holy to be pronounced. 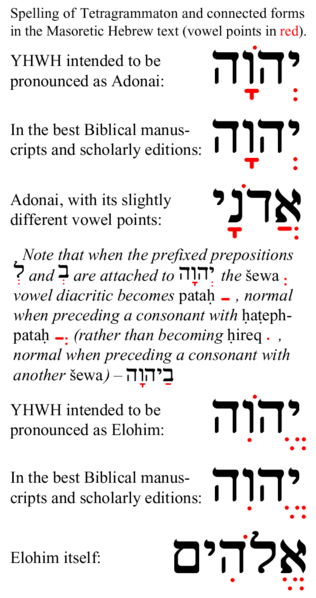 Then they said YHWH is intended to be pronounced as Adonai (another invented term). They kept changing points to make the word YHWH (Yahweh/ Jehovah) look and pronounce like the original Elohim. Certainly, the Jews are totally different group from the older Hebrew Israelite. The Israelite were Arab Semite who descended from Abraham and Jacob. The Jews have different god than the God of Jesus. On the other hand, the Jews are Turkic Mongolians who were created by Turkic Persians and sent to replace and rule over the Hebrew Israelite. They used the Return from Babylonian Exile as a way to insert Turkic settlers into Canaan and colonized it without fighting. Turkic Mongolians are known for identity theft wherever they raid. Support for the theory that YHWH belongs to a foreign group wandered in the deserts of Israel and Arabia can be found in Egyptian texts from the late second millennium, which list different tribes of nomads collectively called “Shasu” that populated this vast desert region. One of these groups, which inhabits the Negev, is identified as the “Shasu Yhw(h).” This suggests that this group of nomads may have been the first to have the god of the Jews as its tutelary deity. Later the Shasu invaded and colonized Egypt and were called the Hyksos “Heky-Shasu”. The Greek phrase Hyksos stood for the Egyptian phrase Hekw Shasu meaning the Bedouin-like, which scholars have only recently shown means “rulers from foreign lands”. 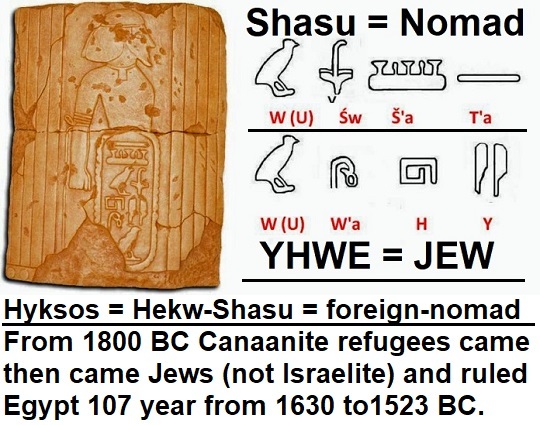 Hebrew Israelite were called “Abiru or Habiru” and their only God for thousands of years is EL, while the Jews were called “Shasu of YHWH” or “nomad Jews”. These are two different nations with two different gods. But finally the Jews and their cult YHWH won over the Hebrew Israelite and replaced their God EL. Some people say it this way” The God of the Jews or the God of everyone.” God is not the exclusive possession of any one people. If we believe in one God, then He is God for everyone. The issue is the religion of EL as it was given to Moses in 1446 BC for the Israelite is totally different and even diametrically opposite to the religion of YHWH which was made up by Turkic Jews in Babylonia in 530 BC. The English pronunciation and writing to EL are in correct because it is AL (אל). 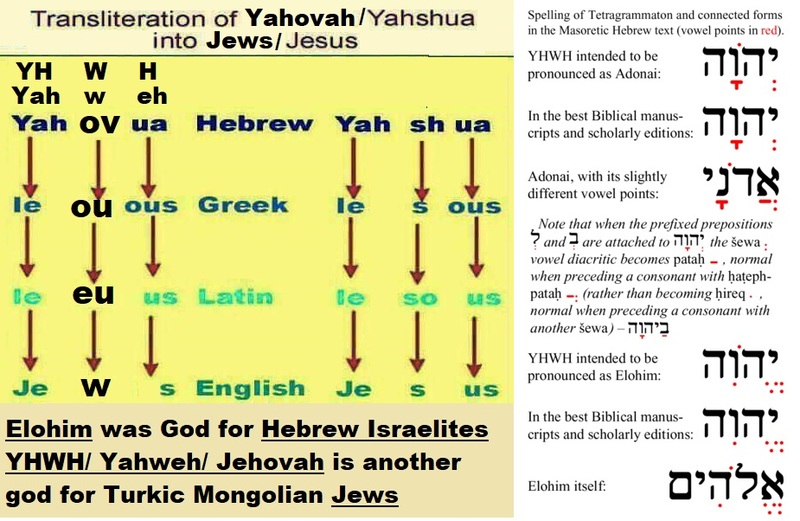 The origin of the word YHWH/JHVH is certainly not frm the same region and probably from Turkic Mongolian origin.